That’s how much market cap Facebook (FB) dumped over the side in a single day when the company crushed Wall Street’s hopes with a soft second-quarter earnings report last week. This was the biggest single-day loss in US stock-market history—and the stock has plunged more since, to a loss of over 20%. The panic has spread to FAANG land, with Amazon (AMZN), Apple (AAPL), Netflix (NFLX) and Alphabet (GOOG) all showing losses right after Facebook’s report, even though many of these companies have very different business models than Facebook. And the one that’s closest, Alphabet, recently reported a blowout quarter. 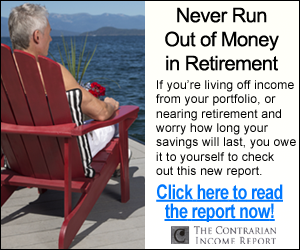 For contrarians like us, this is an opportunity. If you want to find the most efficient way to take advantage of an overly fearful market, you need to sniff out inefficiencies and pounce on them. And there’s a huge inefficiency that can hand us huge returns while we wait for the market to come back to tech. 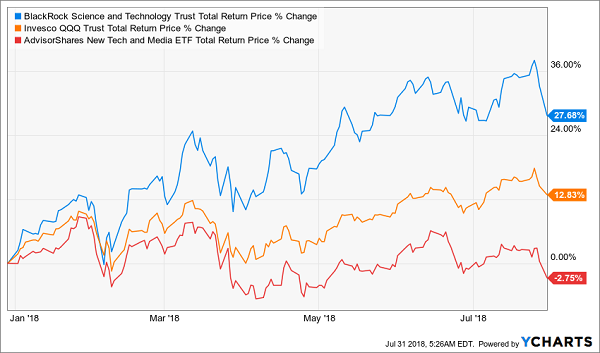 That opportunity lies in the BlackRock Science and Technology Trust (BST), a small closed-end fund (CEF) with just $696 million in assets that often flies below investors’ radar. If you’re a regular reader of my CEF Insider service or my articles on Contrarian Outlook, you know I’m a big fan of BST, even though it’s been priced at a premium to its net asset value (NAV) for a while. 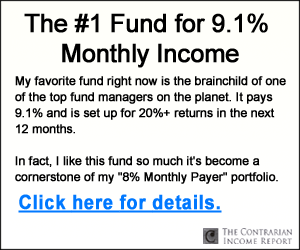 What makes this fund a standout? Has that changed in the last few days, now that the tech sector has faced a rout of panic selling? Yes and no—and that’s where the opportunity lies. 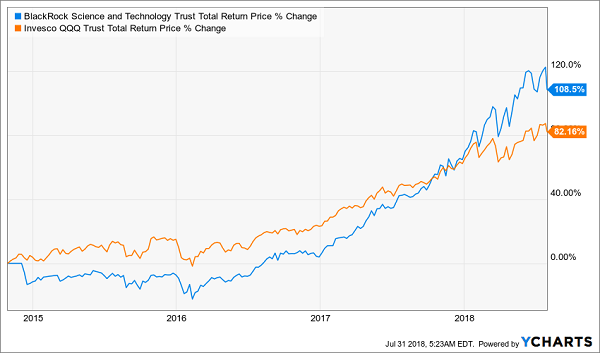 Let’s take a look at QQQ versus BST and another ETF you might have heard of—the AdvisorShares New Tech and Media ETF (FNG), a fund investors use to get direct exposure to FAANG and closely related companies without buying them individually. First, let’s see who’s doing the best for 2018 on a total return basis. It’s not even close. Since I wrote on January 1 that BST is a great option for 2018, you can probably imagine that I’m pleased with this chart. And it should make you feel confident that BST is not a flash in the pan, even when the going gets tough. But things seem very tough now, so can BST continue to beat the market and provide a 5.4% dividend that is 4 times greater than QQQ’s paltry payouts? The answer is yes. To see why I’m so confident, take a look at this chart of BST’s total NAV return vs. that of the competition. On a NAV basis, even after the recent downturn caused by FAANG stocks, BST leads the pack. Meanwhile, that red line you see is the FNG ETF, which is now in negative territory for 2018. 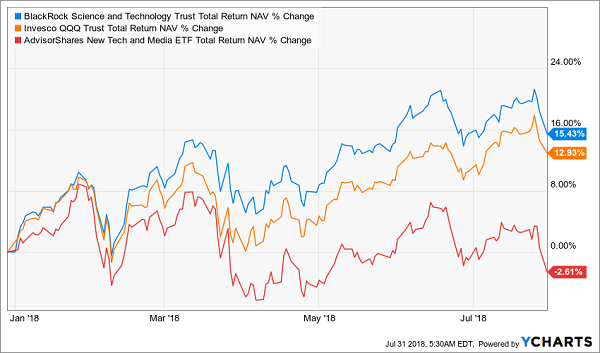 Since the NAV return is the performance of the portfolios that the managers of each fund are running, BST’s outperformance shows that its team has the chops to outperform, regardless of the recent tech volatility. And that makes BST a great buy … but there’s just one snag. 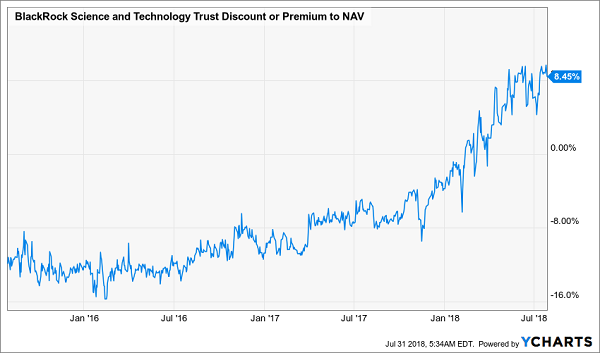 In 2018 alone, BST went from a slight discount to an 8.4% premium to NAV, and its premium has set new records for the fund almost every week since 2018 started. In short, BST is a crowded trade. As a result of that crowdedness and growing fear among tech investors, I predict that BST’s premium will disappear in the next few months. And since CEF investors are much more easily frightened than ETF and stock investors, that premium will probably vanish in a matter of days, resulting in significant losses while the fund’s fundamental performance doesn’t change. In fact, we already have hints that such a trend has begun. BST neared a 10% premium to its market price when FB’s earnings were released, and that premium has begun to vanish on a consistent path ever since. Expect that to continue—until the tech selloff is overdone and investors jump back in. Then BST will turn the corner, begin rising, and see its premium return. Your best move now? Put this one on your watch list, wait for that premium to get a lot narrower, then jump in. In the meantime, I’ve got you all set up with another fund that’s a perfect buy now. You just have to add three letters in front of the word “tech”—to make it “biotech”— and move on to this amazing income and growth play. Unlike BST, the CEF I want to tell you about now is ripe for buying today. 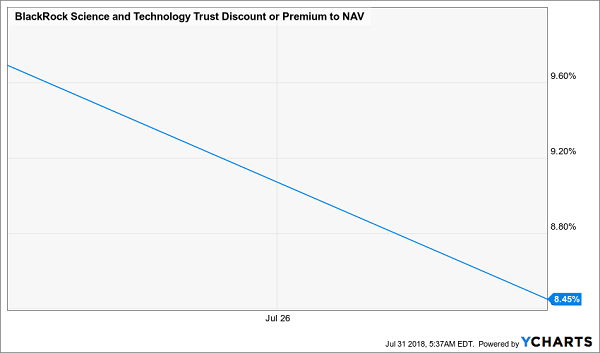 It trades at a 5% discount to NAV, which may not sound like much, but it’s traded at premiums many times in the past—including as recently as last September. And I fully expect this undervalued fund to snap back to a massive premium again in the next 12 months, catapulting us to a huge 20% price gain as it does. That’s just one part of the profit picture, though. Because this CEF also pays an outsized 8.3% cash dividend, and its payout will increase in the months to come as the fund’s portfolio gains give management more cash to hand out to lucky shareholders. 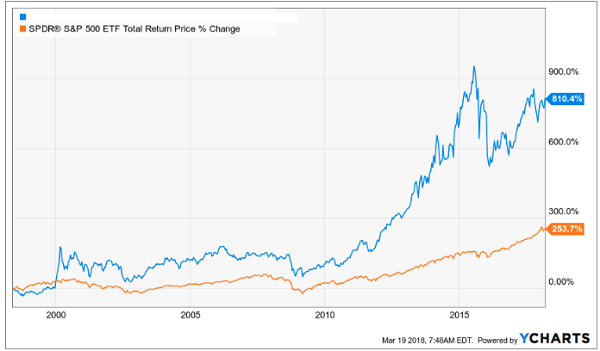 The fund’s history backs up that prediction: check out how it has demolished the market since inception, with a monstrous 810% return! This is incredible—the kind of gain you might expect from, say, a small-cap tech stock, not a conservative fund like this one. And you’d think a gain like that would at least get a few folks in the mainstream media talking. No way. Not yet, anyway. Why? For one, this low-key CEF is tiny, with just a $391-million market cap, so it gets even less attention than your typical CEF does. To give you a little more context, my No. 1 pick is run by some of the smartest minds in the biotech business—researchers and doctors with “boots on the ground” experience zeroing in on the next billion-dollar-plus blockbuster drug. Their secret? A mix of familiar big-cap names that provide steady cash flows, along with tiny companies working on groundbreaking medicines that will deliver overnight price gains. My team and I have gone through this fund inside and out and have come to one conclusion: this CEF’s unusual discount, high dividend and history of crushing the market nicely line us up for life-changing profits. All the details are waiting for you now. Just CLICK HERE and I’ll give you everything I have on this stout fund—its name, ticker symbol, buy-under price and my complete analysis. Plus I’ll also give you the whole story on 4 other top CEFs (with dividends up to 10%) I’m pounding the table on now. Don’t miss this incredible opportunity. CLICK HERE for full details on these 5 amazing CEFs (including my top biotech pick) now.